NASA data leads to rare discovery: Earth's moon wandered off axis billions of years ago | Watts Up With That? March 23, 2016 in Astronomy. Well, the science was settled then, too. PS The archaea may not have known that, I admit. Well, that was unexpected ! .. Seems real science is trying to make a come back !! Elections maybe ? Well Australia, is nowhere near 125 miles nor six degrees away from Antarctica, so it is NOT as if Antarctica moved to Australia, or the pole did. and just what is their evidence that this happened a billion years ago. I’m prepared to believe they could be right about the pole moving maybe even the distance; but ust how do they get the billion years ago evidence ?? G, I think when they spoke of Australia / Antarctica they were speaking in angles and relating that to relative distance on Earth not actual distance – the distance they cite being that on the moon. Not billions, merely millions of years. By measuring the plate movement speed and extrapolating backwards. Gondwana is estimated to have formed about 600 million years ago, started to break up some 180 million years ago. Geologists have indications that there may have been another supercontinent before Gondwana, but as we go backward in time things are less and less certain (unlike climatology). I would also be interested in whether or not NASA has found evidence that changes in the tilt of Earth’s axis can induce changes in tilt of the Moon’s axis. The period of change in tilt of Earth’s axis is about 40,000 years, The phenomenon probably has a chaotic component, possibly because the Moon acts as a ‘strange attractor’. Intuitively, it would seem that the two bodies (Earth and Moon) act upon each other to stabilize tilt and induce procession. Since the center of gravity of the two bodies is near the surface of the Earth, quasi-periodic lunar shifts in axis may be expected to have a period that is multiples of Earth’s tilt period, perhaps hundreds of thousands of years. An expert in celestial mechanics could model the system. I think that a billion years may be excessive. Well I think degrees are angles not distances and not in furlongs or pyramid inches. So if the earth is ten times the size of the moon in pyramid inches, then Australia is still way more than 1250 miles away from Antarctica. The numbers do not add up. I don’t dispute their numbers; just their analogy. Frederick Colbourne, so you’re saying the moon nutates, which is surely reasonable. Maybe the icy regions are at the center of the nutation. When I first started reading about science in the early ’60s I was told by the “experts” that I could depend on the “fact” that gradualism was all that had ever been. Nothing catastrophic had ever happened in our solar system. Then I read the geologic accounts listed in the third book of that Russian so-called crackpot whose last name starts with a V. The evidence was overwhelming that our planet (and others) have seen catastrophic events over the billions of years. I see this report, if it holds up, to be yet more evidence of things not being nice and gradualistic. “We don’t know where the Earth’s water came from.” And there is so very much that we really don’t know. We think we know things that we really don’t know. ” The message is that there are known knowns. There are things we know that we know. There are known unknowns. That is to say there are things that we now know we don’t know. In 2 or 3 billion more years, when the Earth’s mantle sufficiently cools down for magma to solidify, land will slowly erode by precipitations and sediments transported into oceans. Oceans will become more shallow but much larger, eventually all land will disappear. We will have to learn how to live either on the polar ice caps or in underwater cities, embryonic gills stem cells will be most valuable commodity to be traded, enabling us to truly go back to our primordial home. On plus side the global temperature might be a bit more stable. …But vuk, didn’t you watch Water World ?? I imagine also there must also be “unknown knowns”, that is, that which is most abundant during “Final Exams” having surely studied but can’t quite bring to useful memory. But Uncle Vuc, only 2 or 3 billion years left for humanity? Whatever will we do? Where did they get all of the gasoline in water world ?? Can’t frack the oceans. Incidently, this Blue Planet which can be seen from the moon as in the famous earth rise photograph; is NOT blue because of the water. Earth is really a black planet, because that is the color of the deep oceans. We can’t see the black oceans on earth from the moon, or even from a commercial airliner, because it is washed out by the excessive brightness of the blue sky, which looks exactly the same looking down as it does looking up. The blue sky (scattered solar energy) stops us from seeing the black sky, and it also stops us from seeing the black oceans. I presume that if you took a photo of the oceans through a short wave cutoff filter, maybe orange or red, you might actually be able to see some white caps in the photo at suitable times. Well they would be orange caps, or red caps. Vuk, do you know where this came from? Scientific theory surrounding the formation of the solar system postulates water could not have formed much closer to the sun than Jupiter, Siegel said. Tried a few searches but came up with nothing. So suppose we did know where the earth’s water came from. How did earth’s water get to wherever not on earth the water came from ?? The sun contains 99.85% of the mass of our solar system. The solar wind continually streams from it and contains protons (hydrogen ions), electrons, helium ions and some other matter. At previous occasions when Earth’s magnetic shield has been very weak quantities of hydrogen ions would have easily penetrated Earth’s ionosphere and met oxygen atoms in the atmosphere. As Earth’s magnetic field is currently weakening at the rate of about 5% per decade (It was 5% per hundred years during the 19th and 20th Centuries) maybe there will be time later during this century for scientists to measure this phenomena. Surely any body in space that contains oxygen (either free or bound up in rocks) that doesn’t have a magnetic field or only a very weak one, must be a candidate to obtain water in this way. Simple chemistry really. So if earth did not have water until it got it from somewhere else then presumably it did not have life which could originate in water, and it would not have had the forms of life which could make oxygen, so it would not be able to make water out of solar protons. We do have one heck of a lot of water from what I can tell. The Moon is about 4.4 billion years (Gyr) old, plus or minus. The Moon and inner solar system experienced intense asteroid and/or comet bombardment about 3.6-4.0 Gyr ago, which formed most of its current surface features. The oldest rocks retrieved from the moon are about 4.527B years old. http://m.teachastronomy.com/astropedia/article/Ages-of-the-Earth-and-Moon But our sampling of moon rocks has been pretty sparse. The oldest rocks on Earth are sand grains about 4.54B years old, but plate tectonics has scrambled older rocks so thoroughly that it’s possible that older rocks once existed but have been recycled beyond recognition. It looks to me like everything one reads about the early Earth, Moon and solar system is based on an amount of data you could type on a 3×5(7.6×12.7cm) index card leaving lots of white space, a huge mountain of conjecture, and some computer modeling that is given an awful lot of credence considering that it is unvalidatable code and theory. But that’s just me. And the consensus is that we have all that stuff nailed. Current theory is that a few hundred million years after the Earth had formed, it was hit by a planet about the size of Mars. Much of the crust from the colliding object was thrown into orbit around the Earth, while most of it’s core was captured by the Earth and added to the Earth’s core. The colliding planet was formed in about the same orbit as the Earth, which explains why the Moon’s material is virtually identical to the Earth’s crust, and why the Earth has a much larger core than would otherwise be expected. Let’s see… Three billion years ago the moon would be how close to the earth? Simple calculations using the current values for tidal forces on the earth and moon suggest that the moon would be so close to the earth about one and a half billion years ago that the tidal forces would be highly distorting to both bodies. Highly unlikely that the earth-moon system would be recognizable 3 billion years ago (given the current value of the physical “constants”). The good ol’ tectonic constant – if it’s gradual now it must always have been gradual. Sounds enough like climatology to me. That would seem a more realistic idea. Interesting post. Cause a bit speculative. Reason. Take a gander at all those lunar impact craters. Could simply have been momentum redistribution. Even if random events, the ‘N/S’momentum axis must shift uniformly, as the study proved. Positing an Earth like explanation (continental drift) for a body that is not earth like (no iron core, only mantel rock from probable impact formation) is not good science. There’s are timelines for lunar cratering based on which craters and ejecta rays cross which others. Plus a bit of radioactive dating of retrieved rock samples. They make most of that cratering really ancient. Prior to 3B years ago. I would note that there is a lot of lava covered surface on the moon which suggests that there might have been a stage in its history when blocks of surface were floating on molten material. I’d sort of expect that an impact sufficient to shift the rotation axis would leave a pretty conspicuous hole. Do you have a candidate carter in mind? Just pointing some stuff out. There are experts on Lunar geology (Lunology?). I’m not one of them. Wasn’t that the 60’s rock group who did “A Whiter Shade of Pale”? That was a story from Chaucer’s “Canterbury Tales”. The rock group just did a cover of it. First time I have seen the verb “wander” used as a noun. Is it an established usage in this field? Yes, and other fields too. noun an act or instance of wandering. goodold OED comes through again. The slow drift of the earth’s poles is well established. In The Path of The Poles, Charles Hapgood claims that about 15000 years ago the South Pole was near Perth and western Australia was covered with snow, whilst Antarctica was ice-free. The North Pole was then the Illinoisian Ice Cap. The moon’s latitudinal traverse over 18.6 years is 28°N and S. Just as the world’s highest mountains are within that range the deepest of lunar craters along with 56% of the moon’s mass are on the side facing Earth. When Earth and moon so mutually affect each other and with Earth’s poles so continually on the move would it not be more surprising if it was discovered that the moon’s axis had never wandered? IF Antarctica was ice free 15,000 years ago, why have ice cores there recovered ice up to 800,000 years old. You are probably confusing Earth’s rotation axis with its magnetic field axis, which wanders. Ken, and not everyone believes the Earth is round. Banded layers in ice cores is not the only method of determining age. Radiometric dating by e.g. K-Ar, 10Be and 14C have also been used. This is EXACTLY why I LOVE WUWT!! These periodic departures from the necessary drudgery of refuting the CAGW wack-jobs are fantastic. I would simply never hear of this stuff were it not for WUWT. +1 wuwt bringing science to the masses. Whatever the facts, it is very good to see NASA getting involved in actual science for a change, instead of politics and CAGW. Got a couple of problems with this; first they use hydrogen (only) to determine that there’s water. However. carbonaceous chondrite meteors also have hydrogen in the form of organics in addition to water, so the assumption of the H2O molecule being the one remaining may be iffy; indeed the evidence in most articles use the word confident (or similar) that water ice exists there (per article: “The hydrogen, detected by orbital instruments, is presumed to be in the form of ice hidden.”). Then there is “Statistical analysis and modeling” used for this work, as in how often have we seen that go south at NASA and also others working with AGW. But, just maybe the SMU types are better at it? Of course, the shift could be much greater, the ice trail shortened by the sun impinging on its farthest reaches. Question: Could this have been the result of ancient impacts? The “Standard Answer” is yes, the water was delivered by comet impact. On the moon, water will remain in only those locations which *never* are exposed to direct sunlight. Such locations are in the polar regions. From the point of view of someone on the ground there, the sun is on the horizon or just very slightly above. Way down at the bottom of an impact crater, you are in perpetual darkness, shielded from the sun by the crater rim. I meant to respond to the presence of water, not the pole shift. Agreed that there is nothing gradual about an impact event. An Impact would have removed the presence of water as it would boil off into space and there would be evidence of an impact. If the oceans boiled why would all of that water vapor escape to space ? I see no reason why an impact would cause the oceans to disappear from earth. Other than in the region of the impact, the water would simply boil and then re-condense. It would not attain escape velocity, particularly from any combined mass obect. I’m sure it was our fault. The evidence says that the Moon has been tidally locked to the Earth going back to at least to the beginning of the late heavy bombardment (let’s say around 4.0 billion years ago). The evidence for this is the amount of impact sites on the far side of the Moon versus the near-side, for which there is a huge, deep-time difference between the two. I imagine there is room within this scenario for the poles of the Moon to have shifted some at some point, but it would not be by very much (5.5 degrees sounds possible). One would have to see the data here to see if there is “enough” additional concentration of ice to justify the proposition. Then one would have to propose why the Moon’s poles shifted at the time and there would have to be something enormous in terms of gravitation influence to have caused it. This has become the problem in science and academics lately. The pressure to publish something/anything has resulted in all kinds of junk science making it to the headlines. And not just all kinds, but actually a majority of it. One has to have been a long-time follower of science to come to this realization. And climate science is by far the worst of all the disciplines (with sociology, psychology and health science coming in right behind). Astronomy, not so much and perhaps last on the list. I agree with the sentiment of your comment. But rather than “junk” science I would call much of it speculative science presented as if it were established fact. Interesting, though I must scoff heartily at the likely data, which is nothing but a wind stab in the dark by a blind man. It might suggest things in the solar system might not have always been as stable as they are now. Conservation of Angular Momentum is just as compelling as any other Law of Physics. As the moon moves away from earth it’s rotation changes. This is especially true as it became gravitationally locked to keep one side towards the earth. So, does this rule out Anthroprogenic Lunar Axis Change (ALAC) ? Probably related to the invention of the wheel. More likely it was related to when we invented fire (in between hunting the dinosaurs, of course) and we started giving off magical CO2 molecules. Question for the planet physics types. 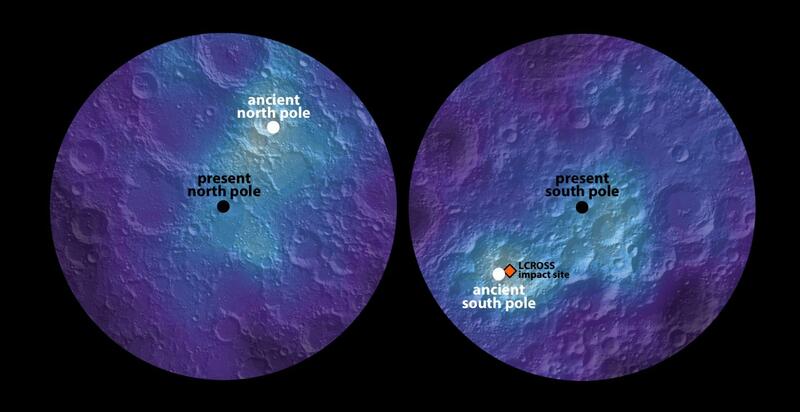 How does NASA know that the wandering from old pole to new pole happened slowly? I think your confused about the moon’s apogee and perigee ! At what point in your moon walk (away) does the gravity switch get flipped from off to on ?? PS The constant tug of the moon on the earth creates the tidal bulges, the frictional drag from which tends to constantly lengthen the day, as in slow the rotation of the earth, thereby reducing its angular momentum. The angular momentum lost by the earth is gained by the moon, partly as a consequence of them both orbiting about their common CM, and not about a fixed central earth. This causes the radius of the moon’s mean orbit to increase. See Kepler’s laws of orbital mechanics. I’m too lazy to look it up for you. So nyet on the moon walk deciding to reverse. The moon is as close as it is ever going to be, so get used to it, before it’s gone. Somewhere it says R^2 omega^3 is constant or maybe I have that backwards or sideways. Hi George, I appreciate your comments as always and this line of thought is right in your area as you’re very knowledgeable on the subject. The one thing I’ve always thought was wrong (I’m not saying I’m entirely correct) is the Idea that the moon will simply spin off into space as it moves further away from earth, you see, the gravity “switch” between the moon and earth never gets flipped/switched off, I know this might sound counter intuitive, though I believe as the moon moves further away from the earth, the gravitational tidal stresses between them will increase [not weaken] to a point where their gravitational attraction will peak, whereby the earth will nudge the moon back, this doesn’t mean that the moon will come crashing down on us, obviously! it does mean however, both body’s will balance each other out in a celestial tug of war, as we can measure the moon moving away from us now, it is flawed reasoning to believe that this will always be the case, maybe if in a few hundred thousand years or even a million years from now our ancestors will be measuring the moon moving closer to earth, will they get a scare that the moon is going to crash into earth? I believe they will understand by then that the moon moves back and forth from our planet on much larger scales than a human lifetime or even centuries. I’m a little confused as to how this is a sensitive marker. The ice boils off when it is exposed to sunlight, so if the craters with water ice at the poles then moved 125 miles, away from the poles, they would be exposed to sunlight and the water ice they contained should boil off. So what is the origin of this hydrogen they are measuring? Did you really ask where the origin of hydrogen comes from? No, what I asked was what is the origin of “this” hydogen they are measuring. Is it from ice, or something else? The authors of the study say they “presume” it is water ice. Some of the largest and intermediate (e.g. Tyco) impact craters have been dated by radiometric techniques. Glad that is settled, thanks all. Moon should not get so drunk as to wander off from her axis. Is there s program for that? Well that dazzling display of science seems designed to mask a more pertinent question: what about sublimation? If they are proposing that there is ice on the moon since a 3 billion years ago why hasn’t it all simply sublimated and blown off into space. If not it must be being replenished…. where from? Low energy neutrons indicate the presence of hydrogen, the dominant molecule in water and ice. What? That’s it? This whole fairy tale about ice lasting 3 billion years has been spun out of neutrons which indicate hydrogen , not water. How about this being some other hydrogen containing molecule that would not evaporate / sublimate ? Siegler’s attempts to explain all this as though he is talking to a retarded five year old does not help. He seems to imagine that he is so far ahead of the rest of humanity that he has to talk about “goo in a lava lamp” and explain to us how far 125 miles is otherwise we would not be able grasp such abstract scientific concept on our own. This is sounding like an archeologist who finds an unusual stone and builds a whole society of pagan worshippers for whom this staone was an important phalic symbol representing fertility, the renewal of life in the spring time and blood sacrifices of small children. PS Tasmania, the most southerly part of Australia is more than 45 degrees from the pole , not 6 degrees. So his patronising bunk trying to explain that is so far off as to be laughable. In dark crater the temperature can be about 50 K and water ice in vacuum sublimates somewhere above 100 K. So one can have ice in dark crater of the moon which doesn’t sublimate in millions of years. It’s likely that 3 billion years ago the Moon may have still been somewhat warm from it’s relatively recent formation- or very big space rock may have still been impacting the moon rather frequently. In addition over 1 billion years of time the chance of specific area getting hit by space rock larger than a house in a local region would be likely. Or if one had clock which each second was 1 million years and ran it for 1 billion years [1000 seconds – 16.7 mins] It’s raining lots of dust and pebbles, house size, rocks, and mountain size rocks which impacting the surface at over 10 times the speed of a bullet. In addition the falling ejecta from more distance and the larger impactors are coming down at around the speed of bullet also blanketing a specific region. Or there is not bare exposed bedrock, instead the Moon is covered with few meters of pulverized and partial melted rock which is compacted. And on top of this is few inches fine dust. the moon also had large lava flow from lunar early volcanic activity. So unlikely one has ice which has remain ice in top couple meters of regolith which is much older than 1 billion years. Ice vaporized and migrating across the surface and downward may have reached the moon over billion years ago. Thanks for a very informative reply. A scientific explanation is much more use than the toddler talk and inappropriate analogies of the press release. Far from being an “exclusive club” this seems more like a statement of ignorance. The surface of the gas giants and Venus are not visible so the number of planets on which we even have the possibility of seeing evidence of a pole shift is very limited. I would have thought that null hypothesis is that all bodies would have experienced changes likely to produce some permanent polar shift. The fact the we have not been able to detect or refute such movement does not imply it is a rare situation. Lunar surfaces that do not receive sunlight are so very cold that ice sublimates at an exceedingly slow rate. Most lunar surfaces also contain large amounts of hydrogen implanted by the solar wind. This also escapes the surface upon heating. Why would it blow off from the moon just because it is in the moon’s atmosphere rather than on the ground. Where does it get the energy to achieve escape velocity ?? The presence of water on the Earth and the actual presence of the moon, the big hole on the Earth were most of the ocean is was explained long ago. The Sumerians I believe stated that a giant watery planet named Kingu collided with the Earth, taking a large chunk out and depositing huge amounts of water, the moon was also a result of the collision. For me this is better science than any other theory I have read, they say they got the information from the gods, must be right. Can you please give a reference to this Sumerian story? I’m familiar with Kingu the god, slain by Marduk. I have never heard of Kingu the giant watery planet. In fact, it’s news to me that Sumerians even had the *concept* of a planet as something other than a moving light in the sky. I’d really like to know which actual ancient text(s) this is taken from. Don’t understand the question. Every body know that a molten earth ‘ s surface did send ‘inherent’ water into outer space. We regained atmosphere + ocean filling water by ‘dirty snowballs’, the comets, what size so ever – over the billions. 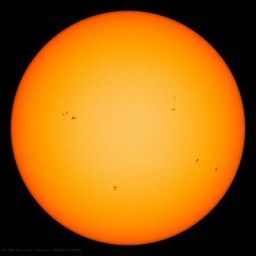 We’re losing atmosphere daily by solar wind, meteors, absence of gravity at TOA. … and receive fill packs – dirty snowballs. /ignore if someone already said. at what altitude (TOA) does gravity cease ?? That’s quite stable an equilibrium! The problem with all these discussions about the origin of water and ice on the Earth and the Moon is the theory about the formation of the solar system is all wrong. Hot gasses in space do not gather together to form larger bodies any more than steam. Steam is 1700 times the volume of water. All mater is created in the Black Holes that have exploded. After the matter has cooled to absolute zero it can start to accumulate with the heavier atoms of radioactive metals leading the way. The Moon was formed at the same time as the Earth. The oceans were created by the larger Earth capturing most of the Moon’s water. When life first appeared on Earth the Sun was much smaller and unable to heat the Earth. Thus cosmic rays created a thick cloud covering the entire Earth. With this insulation the heat generated by the Earth’s radioactive core was able to be retained and create a living planet over the entire surface. The planet Mars also had oceans and thick clouds to retain its heat. The ferns and horsetails that covered the earth can’t grow in direct sunlight. The primary animal life was gigantic earth worms. The ideal temperature of these life forms s is 55 degrees F. This continues through the Carboniferous Period with vegetation that clovers the earth.Thus we find the bones of alligators and Dinosaurs on the north slope of Alaska. As the Sun grew more powerfull the solar wind held back some the cosmic rays that generated the protective and warm blanket of clouds that had covered the entire earth. . Thus flowering plants and bees appeared. The dinosaurs disappeared . Mars lost its cloud cover, and then its oceans blew off into space. .